The product can contain small precipitates giving a cloudy appearance. However this does not affect the performace of the product. Leaving the product at room temperature in the dark for a few hours may help. Please use as normal and if you do experience problems, contact Scientific Support. Our Abpromise guarantee covers the use of ab6789 in the following tested applications. The section was pre-treated using pressure cooker heat mediated antigen retrieval with sodium citrate buffer (pH 6) for 30 mins. The section was incubated with ab8224, 3 µg/ml overnight at +4°C. An HRP-conjugated secondary (ab6789, 1/2000 dilution) was used for 1hr at room temperature. The section was counterstained with hematoxylin and mounted with DPX. 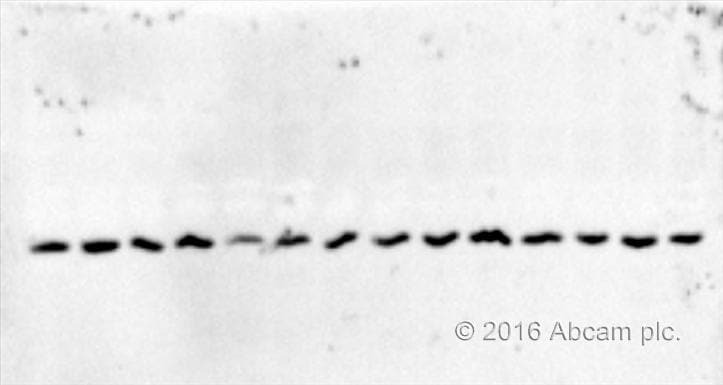 Western blot - Goat Anti-Mouse IgG H&L (HRP) (ab6789)This image is courtesy of an anonymous Abreview. Immunoprecipitation - Goat Anti-Mouse IgG H&L (HRP) (ab6789)This image is courtesy of an anonymous Abreview. ab49969 Immunoprecipitating HA Tag in HEK-293T whole cell lysate. 25 µg of cell lysate was incubated with primary antibody (1/2500 in lysis buffer) and matrix (Protein A/G) for 6 hours at 4°C. For western blotting a HRP-conjugated goat anti-mouse IgG H&L (ab6789) (1/1000) was used to confirm successful immunoprecipation. ab6789 was used at dilution 1/10000 with the primary antibody ab55504 in WB. See the review on ab55504. Secondary antibody (ab 6789) was used at a dilution of 1:5000 in 5% BSA. Placental lysate was used. primary antibody was purchased for beta actin from pierce antibody. gel: 10%, 200 V for 35 min. It would be appreciated if you can send it to our address in France then we can arrange a delivery safely to the customer. I have spoken to my colleague and we can certainly ship the replacement vial directly to your company Qafqazbiotex Co to Georgia. Once you place a new order, we can add this item (free of charge)(ab6789) to your document and despatch them together. However, we are unable to send the product via France. Let me know if you have any further question and when the new order will be ready. Thank you for your response and for confirming the order number. I could arrange a new vial of ab6789 as a free of charge replacement or a credit note. Please could you discuss it with your troubled customer and let me know how you wish to proceed with this enquiry. Following your email, here it is related lot number. Hope it would helpful for you. Thank you for confirming the batch number. In my previous e-mail, I have also asked you to provide your Abcam Order number (or your Purchase Order Number) with the date of purchase. We do not have any order in our system from Georgia so it would be interesting to know how you purchased this product. We found in some cases (such asAB6789)the antibodies inside the tubes are in a gel form. What's the explanation for this if customer asks us in that regards. Is these kind of gel forms are normal? Thank you for your enquiry regarding ab6789. In order to take this complaint further, could you please confirm the batch number and your Abcam Order number (or your Purchase Order Number) with the date of purchase.